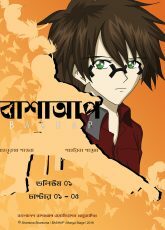 It’s a manga about Bangladeshi Martial Art -” Bashap ” . The protagonist is a boy named ” Shobdo Shomudro ” who tries to avoid the surroundings and have an average life . But suddenly he gets a new motivation in life . This manga is permitted by Bangladesh Bashap Association on 8 April, 2018 . The base story is overall for a sports manga. Art-style needs some development in some cases. Character’s personality seems to be developing just fine but seems/feels like the author lacks knowledge about the male gender personalities. Suggesting the mangaka to give some sort of hint about why he acts the way he is and a bit of world building would be nice too. The art-style needs improvements. Good, overall. So far so good. Keep it up. The art needs improvement,but not bad. next chapter kobe release hobe?? Its really impressive overall. Your art need improvement to be said the subject (charecter ) need 3d effect if you are going that way , you are trying Perspective thats good . Work on propotion, as far as you are using 2 point or 3 point perspective . Use shadow image on back ground thats more comical approach . As a shonen manga it lacks gutsy based dailouge . Its happening and improvising . So best of luck. Thank you so much for your support! We are grateful!! Oboshshoi ashbo . Khub bhalo hoechhe tomader workshop. SOS Hermann Gmeiner is a nice institute. Joss hoise apu…ETA ki monthly? ?apu dark fantasy type er er manga series chai….amra ki pabo?? Thanks a lot. Monthly hoy but apatoto ektu off jabe koyek mash. Dark Fantasy ashbe next year middle e . Nam ” August’s Journal ” . ©copyright 2019 Shahnuruma Shantona and Shahrina Shantuma | All rights reserved . Design and Development By Creative it Ltd.